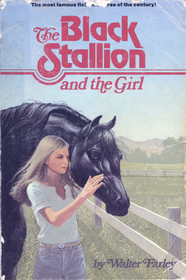 omg this was my fave Black Stallion book as a kid (besides the original flavor) I was hoping you would review this. LOL amazing this came out in when? i just looked up and out in 1971 (Wow I had no idea that this serious goes back so far!) but let’s say I didn’t read it when I was 7 LOL. I probably read it by 1979-1980 when i was 13 or so. But I did love it but of course I didnt notice all those things you are pointing out now 😉 HA HA HA HA still thought it was a better book than most of them…. Pretty advanced for 1971. So that’s something. I bet that he described the track and trainers attitudes pretty accurately. Which is sad because we should be farther along….. I can’t believe I didnt even know this book existed. Bloody brilliant review – as always! I never knew about this one…and I’m really glad I didn’t because wow. I love your reviews; they are the best in Blogland!!! If I recall correctly this one and the next one were done as memorials for Farley’s daughter Pam. So maybe that is part of why Pam in the book is such a hippy perfect sort.